Woah. It’s been MONTHS since the last time I wrote here. Thank you to all my twitter readers!! Hope you get to read shineyourlightph too!! Soon, I’ll write there. I am still writing here tho! Last summer, I have watched an old romantic comedy film entitled ‘How to Lose a Guy in 10 days.’ It is about Andie Anderson (Kate Hudson), a writer who works for “Composure” magazine as a ‘how-to-girl’ and Benjamin Barry (Matthew McConaughey), an advertising executive and ladies’ man who, to win a big (diamond) campaign, risks that he can make a woman fall in love with him in 10 days. Andie Anderson is bored and she wants to write about essential things such as politics, economics, life– things she actually cares about. By the way, Composure is a magazine for ladies, it talks about cosmetics, health, fitness and everything about women. Her boss will give her the license to write what she wants if she’s able to ace the ‘how-to-article’ assigned to her. Her column ‘how-to’ is not learned from book, Andie has to go over and experience it first hand. Yes, you may call it as an experiment. So her boss asked her to write “How to Lose a Guy in 10 days”. She needs to find a man and actually lose him in a span of 10 days. On the other hand is Benjamin Bary who needs to make a woman fall inlove with him in 10 days to win a big campaign. Obviously, their world crossed and Andie thought of having Benjamin as Agent X for her experiment and Benjamin thought of Andy as the perfect one who will fall in love with him in 10 days. And so their lovestory has begun. I am not here to talk about the film. But, hey, I liked the film! It’s funny and touching. Anyway, I am here to launch my comeback project in this blog and that is the “How-to”. So for a year, I will experiment and experience things first hand and write it in a “how-to” format. It can be “How to lose weight in 30 days” or “How to make someone smile”, etc. I still don’t know the topics and how often I will be posting or how much time does it need for one “how-to”, but I am targeting to publish at least one per month. In a year, I’ll be having 12 “how-to”s. Evidently, I got this concept from that movie. It looks exciting and fun, and I want to explore life and learn from it more. I think it will be a way to mature. Also, I have a heart for writing and I desire to develop my skills and I want to write based on my own experience. I may not be that good writer, but who knows, someday I may be one! I may not be a writer by profession, but hey, you don’t need to be employed and get paid to become one! This also applies to your dream! Pursue it in any way you have and can! You can be that ONE! This blog just turned five this year, and I am hopeful that this blog my heart will continue to reach people and their hearts. Don’t worry, I won’t do horrible and unpleasant things in this “how-to” project! Hmm, maybe a little bit of crazy things! Hahaha! It’s my first day today in my new office. Obviously, I still have nothing to do since I am writing here. Hahaha. Well, I am waiting for my boss to finish his task so he could train me. Yes, I need to undergo a training. Anyway, I like the environment here, homey feels, morning schedule, 6:30 am to 3:00 pm. I need not to brave the heavy traffick with other people. My travel time to work (and on the way home) is peaceful and smooth. And I can do things I need and I want to do after work, since it is still early. I thank the Lord for this schedule. I realised that it’s both joyful and painful to be attached with ‘whichever’ and ‘whoever’. Joyful because you get to learn from it, or you get to share your life with. You know, there are things I never want to lose, I am sure you, too, have. But it’s too painful that the way to not lose it is to actually lose it– to not be attached, to surrender. We surely lose the things/people we keep to ourselves, but if we share it or surrender it to God who reigns, we don’t have to lose them. And if it is truly yours, it is yours. You need not to fear to surrender it, because in the first place, it is yours. I don’t know if I am making sense here. There are things we thought of having now, but God says wait, let me take over. For example, you really like this brand new phone, and you’re really praying for it, you save money, you took brochures to examine it and took time to learn it. You passed by the store everyday to check this phone if it’s still alright. It is as if you already have a communication and relationship with it. Until one day, you thought you are ready to take this phone but when you went to the store, the seller says it’s taken back to the factory for improvement so that it can function well and serve you well when it is ready and done. And then you also realised that you are still not yet ready to have this phone because it is high maintenance, and so you decided to ready yourself more and improve more until that day the phone and you are ready. That waiting process and the circumstance you lose the chance of having the phone is God saying ‘let Me take over’. You lost the phone in that very moment, you surrendered your desire of having it, but someday when it is innovated and when you are ready and the feeling of having it is still the same, then you’ll have it– when everything is ready, in the fullness of time. That waiting process is a learning process– exploring yourself and your world more, seeking God’s heart more. That waiting process is also a testing process. Because, for sure, there would be mobile phones which will be released sooner or later, would you wait for the phone you desire or would you take another one? Yes, it’s a test for you, of your loyalty, faithfulness and desire. The journey will be hard, but fore sure it will be Grace-filled. There will be times you will think of that ‘phone’ or miss it when you get to pass by the store it once stood. I know it’s hard! But trust God in every situation you are facing. Trust God. Trust God. Stay calm, easy. I missed this space!! Just want to say that I am coming back here. Happy Independence Day, Pilipinas kong Mahal! Today I timed in at 1 pm and timed out at 10 pm. Basically this day was an orientation day. We met the heads of each department and they discussed their thing. I also met new friends today. My first friend was PAT. It’s funny how the PATs of this world are befriending me. Well, I have many close best friends whose names are Pat and Pat and Pat. Hahaha! So when i met her (Pat) I smiled because I have an additional Pat in my life and I know we’ll be close because we come from the same team, you know we’re teammates. LOL. So my first group of friends was them, (above photo)but I forgot their names. I just remember Pat because she offered me food. Haha. I’m never good at names!! 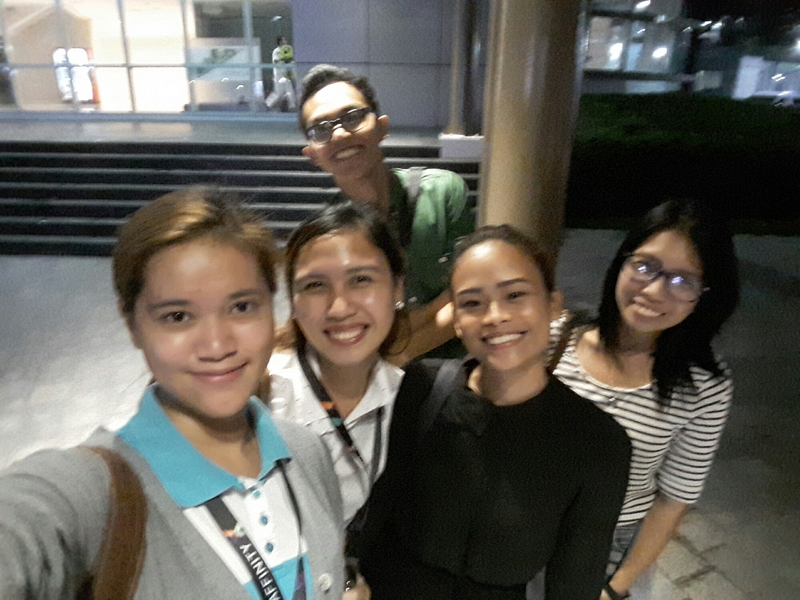 Some new hires are sosi . They studied from Ateneo and Benilde and when they talk they seem to have so much fun because they understand each other. And they ate at expensive restaurant and me? I looked for a buy 1 take 1! Hahaha. I do hope they won’t read about this. Well, today is a good day and it needs to be chronicled. I hope I’ll do great in my first work! Pray with me! I am at Church listening to Midweek Service, it’s 8:01 pm and I just want to say that there are people who will always overthink everything— there will be people who will think beyond the reality to the point that one needs to defend him/herself. Nothing, I just want to say it. You know, there are comments better unsaid, remember that. Dear Self, Be patient, be careful, understand more, love more. Earlier today, I preached in our Church. 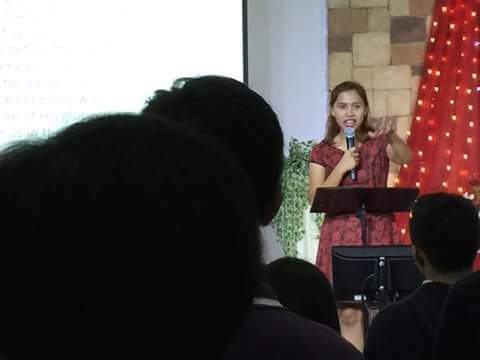 It was my first time to preach on a Sunday and in a service. Yes I was in panic but still I was in God’s presence and there I was safe, controlled and filtered. My prayer was may Jesus be glorified and may He increase. My prayer was may the youth will hear Jesus through me– that Jesus may be known. My heart is happy because God used me. When God uses you, He will let you feel that saying yes to His calling is the best decision you have made! Indeed, there’s no greater joy than obeying God. Obedience to God is a blessing, for in the process of obeying He will teach you many things that are essential to your life and He will bless you in all aspects. When a preacher preaches, whatever he/she has prepared, the Holy Spirit will always overrule— you will say things on the spot, you will cross out words and won’t say it at all on the moment the Holy Spirit tells you so. The thing here is God will speak and when He does, He truly speaks. He is not boxed with our script, words and outline when He wants you to say something to His people, He will give you the words and He will enable you and He will empower you. The God of this universe– our God– got everything covered– He covered everything by His grace. I wanted to say no to this speaking assignment but thanks be to God who has let me speak. I am more than blessed and I realised that saying no to God would not help me grow as a person– it won’t help me at all. Saying yes to God is gaining everything and saying no to Him is losing everything. C’mon, respond to your calling. The time is now. Say yes to Him. Enjoy God fully! The Lord be praised and glorified.